Hello everyone, it’s Lindsey! I’m about to get real honest with you all, so hold on tight. It’s sometimes hard to be on a creative team! Don’t get me wrong, there is so much awesomeness that comes along with being on a team but sometimes it can be difficult to constantly be creating on demand. Today’s entry was one of those moments but I love the end result! Check out the process video to see how this entry came together! I didn’t quite know where to go with this entry but I did know that I wanted a bold title, declaring that “I am His beloved”. After I got that down, using some stamps from this month’s faith art box and the Zion Alpha Set, I looked at my supplies to see how I could fill in the rest of the margin. I don’t know about you, but I always seem to have a lot of the wonky hearts left over so I challenged myself to use those in this entry. How fun are these wonky flowers that I created with the heart stickers and some enamel dots! The wordfetti was perfect for guiding my journaling. I journaled some simple statements and a short prayer in a MadLib style with the wordfetti stickers and my own handwriting. I love how the stickers highlight some key words and break up the look of my messy scribbles. It may have taken me a little extra time to come up with an idea for this entry but I’m so thankful to be a part of this team which helps keep my in my Bible on a regular basis! Head on over to the shop and grab this month’s Faith Art Box, if you haven’t already, and let’s journal some bold statements about who we are as beloved women! I love your openness Lindsey. 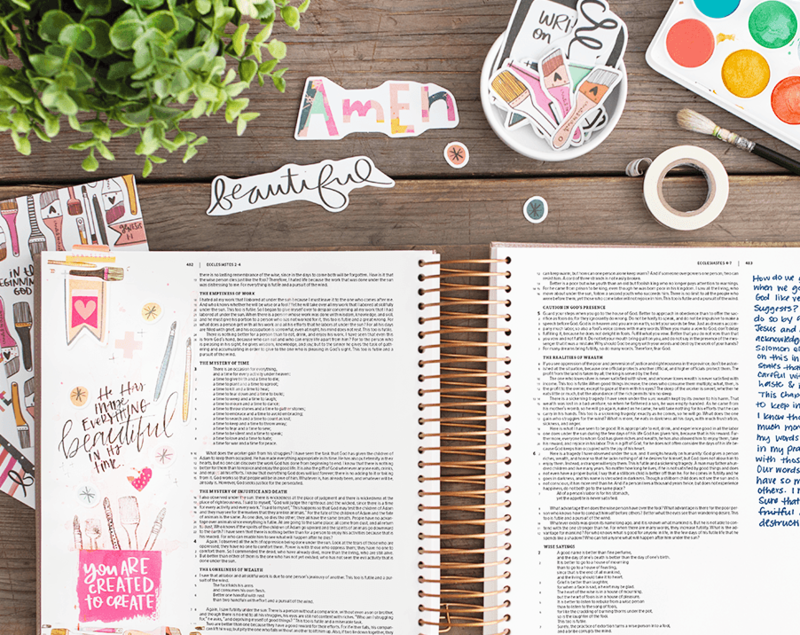 So you know, you were the first contact I had in Bible Journaling & it has truly inhanced my devotional time with the Lord. My health was waning, my dear little g’nephew (now my grandson) needed a home & I had just visited Bethel Church in CA where artists were painting during worship. ( something I had never seen before. It was deeply inspiring .) All these events came together in God’s perfect plan & I started painting in my bible after 46 years of lovingly studying/reading it~ Thank you doll! Don’t ever be discouraged during a “dry-ish” spell, that’s when God pours water out of a rock! Just love watching you and you also inspired me to start Bible journaling and I have a LOT of devotional kits from different companies and I love every one of them. This page is lovely and thanks for sharing your love of God with us!